SNEB is in the process of authoring its first position paper. The current paper in review is on sustainability within the dietary guidelines. In order to be inclusive of the expertise and viewpoints of the entire membership, the process gives members the opportunity to review and submit comments to the authors through an online review form. Comments will be compiled and evaluated by a working group of the JNEB Position Papers Subcommittee before being communicated to the paper's authors. The deadline for member comments is Thursday, April 12. If you have questions about the process or are unable to access the links, please contact the SNEB office at info@sneb.org. Important: This paper is a draft and should not be distributed or shared. Review Paper and Comment. This webinar will support students and other researchers to prepare excellent research posters for conference presentation. Coherent conference posters facilitate an organic exchange of ideas between the presenter and the audience. 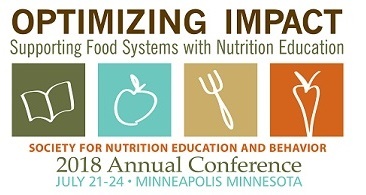 Webinar attendees will learn the best practices for developing and presenting high impact conference posters, in perfect time to prepare for SNEB's annual conference. Participants will learn how to organize and effectively showcase their contribution to the field and will understand the added benefit of presenting their work during conference poster sessions. Participants will understand the value of research posters and the purpose of poster sessions. Participants will be able to describe the best practices for creating high impact posters, including organization, layout and how to effectively showcase their contribution. Participants will learn how to read and engage their audience in meaningful discussion. City and state: Washington, D.C. This year marks the 50th volume of the Journal of Nutrition Education and Behavior. In celebration of the first 50 years of the Journal, we've highlighted several articles that help tell the story of JNEB and the profession over the past five decades. Access the content here.